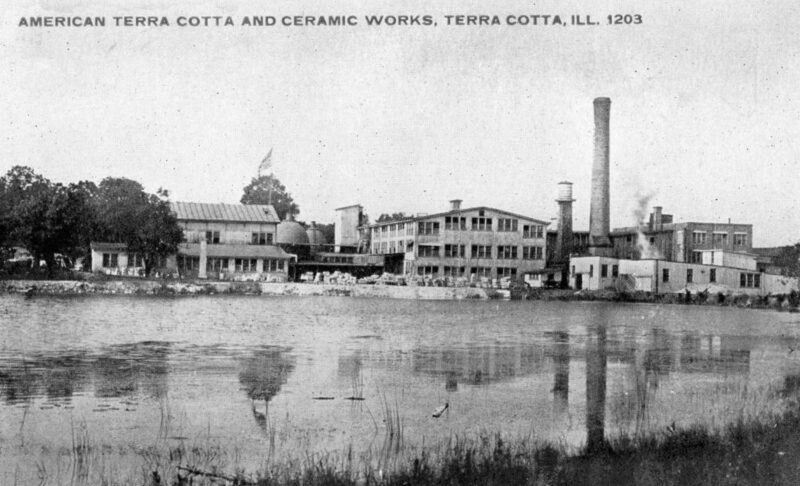 American Terra Cotta & Ceramic Co.
During the late 1800s and early 1900s, Crystal Lake enjoyed nationwide fame through the manufacture of architectural terra cotta and TECO pottery at the American Terra Cotta & Ceramic Co. factory. The company was started by William Day Gates. William D. Gates was the son of Simon S. Gates, an early settler who owned large tracts of land in Crystal Lake and Nunda. William grew up in Crystal Lake and went on to become an attorney in Chicago. 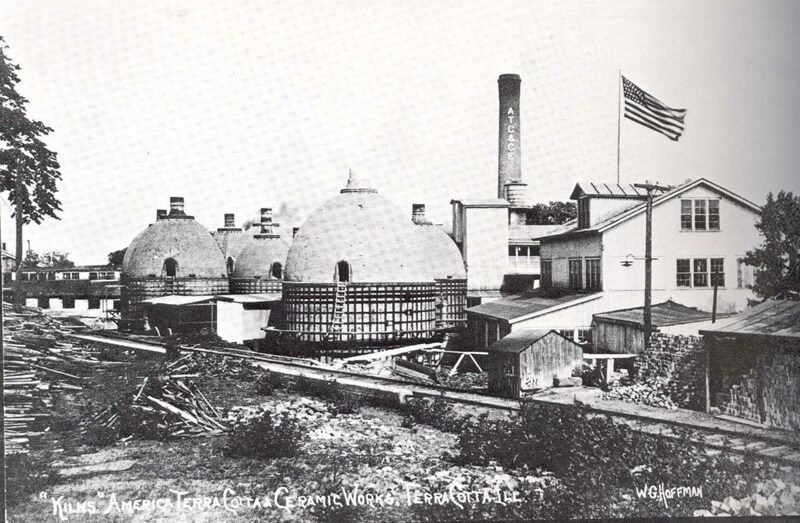 After his father’s death in 1876, William D. Gates moved back to the Crystal Lake area, investing in the Spring Valley Tile Works factory, which was located north of Nunda. The factory was built near a dam on a former mill site. The company’s primary operation was to make bricks and drain tiles from local clay. In 1887, fire destroyed the drain tile factory. Gates rebuilt his operation, expanding the clay works and starting the production of decorative, glazed terra cotta. It was at this time that the company name was changed to American Terra Cotta and Ceramic Co.
From a plain drain tile factory, the business grew and began to turn out some of the finest architectural terra cotta known. The great architect, Louis H. Sullivan, once worked there with American Terra Cotta’s own renowned modeler, Kristian Schneider. Between them, they developed the ornamental design for architectural terra cotta known as the Sullivanesque design. The workers who lived in Crystal Lake rode a special “work train” each day to the factory. Terra Cotta was such an important industry to the area, it had its own railway station, post office and even its own band. Carloads of architectural terra cotta were produced and shipped out across the nation. Samples of the ornamental works can be found on several buildings in Chicago, including the famous Wrigley Building on Michigan Avenue. Downtown Crystal Lake also has several buildings with architectural terra cotta, including the Teckler Building, Warner Building, United State Bank Building, and Raue Center for the Arts. In addition to architectural terra cotta, the company also produced decorative pottery known as TECO pottery. Today, these ornamental pottery vases are in demand as collectible and are very valuable. In 1934, the American Terra Cotta and Ceramic Co. was purchased by George A. Berry. The manufacture of terra cotta was discontinued in 1966. Today, the company is still under the leadership of the Berry family and is known as TC Industries, Inc.